How to create a Lesson using the Picture Slider Component? You can use this component to display a collection of pictures as a slide show in the lesson. 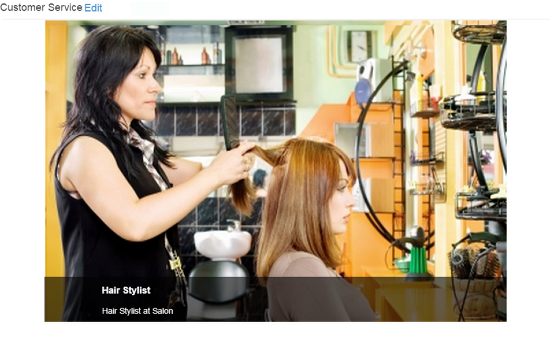 Users can easily understand the pictures by heading and sub-heading descriptions in each slide. The Picture Slider woks just like a carousel. You can configure it easily if you imagine it as a carousel. A picture appears in each slide. When the user hovers the mouse with a header and short explanation text appear for the relevant picture. • The heading and description text are optional. • You can add as many as images in a slider. • You can set rotation method of the picture slider. • You can enable pagination for the slides. Then click on the Picture Slider component icon as shown in the above image. You will see a screen similar to the image shown below. • Set the dimensions of the picture slider in pixels in the Width  and Height  fields. 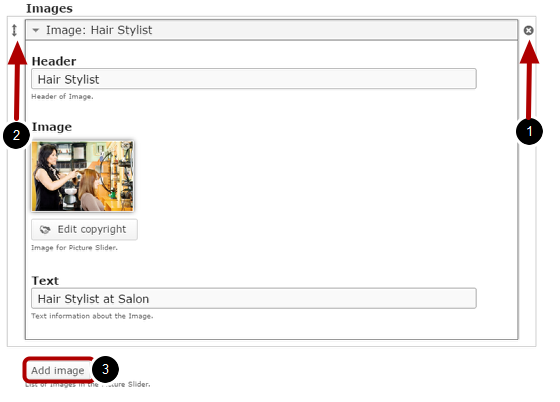 • Add an optional header for the image by typing it in the Header  field under the Images title. 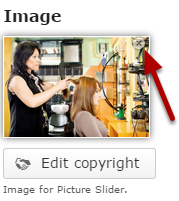 • Add an image using the ‘+‘  icon and edit the copyright details of the image by clicking the Edit Copyright  button. 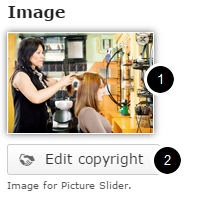 • Add a short description text about the image in the Text  field. 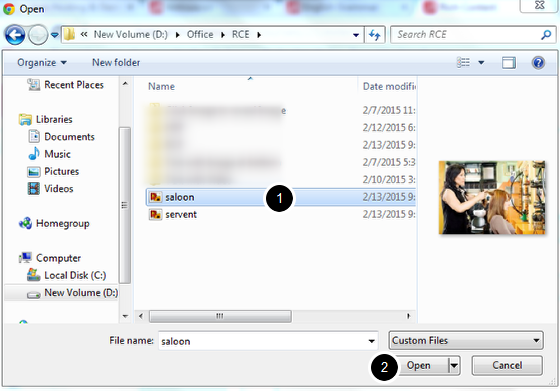 • Add more images to the slider by clicking the Add image  button. • Click the Circular  checkbox under the Advanced Settings title if you want to make the slider circular. • Click the Infinite  checkbox if you want to make the slider infinite. • Set the scrolling direction of the slider to horizontal or vertical using the Direction  drop down. 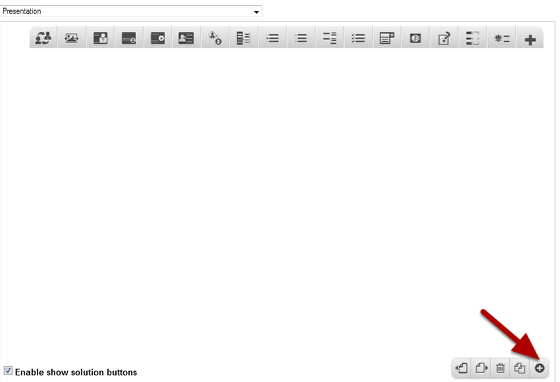 • Check the Pagination  check box to show pagination under the slider. • Set the scrolling effects for the transition using the Scroll effect  drop down menu under the Scroll Settings title. • Set the number of items to scroll by typing the value in the Items  field. • Set the duration of the transition by typing the value in the Duration field . • Enable the automatic rotation by clicking the Automatic Rotation  checkbox. • Set the number of items to scroll by typing the value in the Items  field under Auto Settings option. • Set the duration of the transition by typing it in the Duration  field. • Click on the Remove  link to remove the component from the page. Type the width of the Picture Slider in pixels on the Width field as shown in the above image. 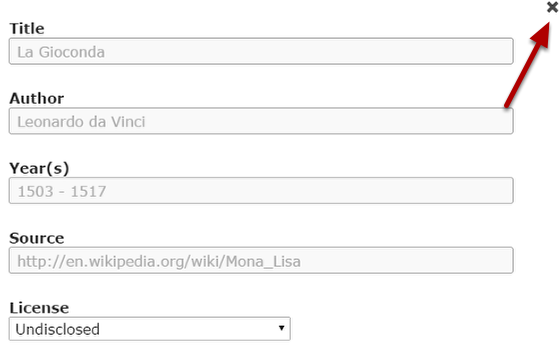 This field is mandatory, and you must type a value on it. Then, type the height of the Picture Slider in pixels on the Height field as shown in the above image. This field also is mandatory. You can add an image to the page by clicking the '+' icon as shown in the above image. You will choose an image file as shown in the below image. On the above screen, select the required image  and click the Open  button. You can see image being uploaded as shown in the below image. Once the image has been uploaded, it will be shown under the Image title as shown  in the below image. You can also update the image without removing it by clicking on the image. You will be offered to select the image again as mentioned in step 5. Type a short description text about the image on the Text field as shown in the above image. This field is not mandatory. You can see the added image as shown in the below image. By default, there are only one image available at the beginning. If you want to add another one, click the Add Image  button below the currently available options as shown in the above image. Another image will be added after you click the Add Image button. You can remove any answer by clicking the X  button on the top right corner of the Option window. You can also change the order of the answers by dragging the Double Headed Arrow  button on the top left corner of the Option window. Similarly, you can add as many images as you want. You can set the Scroll and Auto Settings options under the Advanced Settings option. Click on the arrow button shown above to view the settings. You will see the below screen. On the above screen, you can edit the advanced settings for the picture slider shown below. With this option, you can determine whether the slider should be circular or not by checking the Circular checkbox shown above. This option is optional, and so tick the checkbox if you need so. By default, it is enabled. 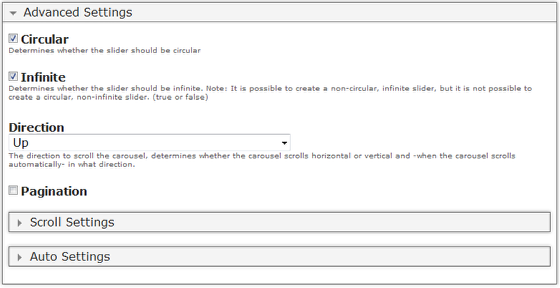 If you click Circular checkbox, you can determine whether the slider should be infinite or not by checking the Infinite checkbox shown above. This option is optional. By default, it is enabled. You can set the direction to scroll the carousel, determines whether the carousel scrolls horizontal or vertical and -when the carousel scrolls automatically- in what direction. Clicks on the Direction drop down to select the scrolling direction such as Right, Left, Up and Down. It is set to Up by default. Pagination is the sequence of numbers assigned to the slides in the picture slider. It can be seen as dots under the pictures. By clicking the Pagination  checkbox shown above, you can enable the pagination for the picture slider. This option is optional. By default, it is unchecked. 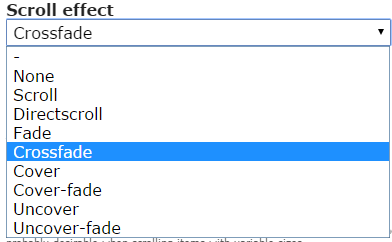 By default, this setting is set to Crossfade. You can have a look at the available options of Scroll effect dropdown menu in the below screen. You can also set the number of items you want to scroll for each transition in the Items  field. The pictures between these slides will be skipped. Type the number of milliseconds in the Duration  text field to set the duration of the transition as shown in step 12. If less than 10, the number is interpreted as a speed (pixels/millisecond). This is probably desirable when scrolling items with variable sizes. You can enable the auto settings by clicking the arrow button with Auto Settings title as shown in the above image. You will see the below screen. Enable automatic rotation by checking the Automatic rotation  checkbox. This option is optional. By default it is enabled. Set the number of items you want to scroll for each transition in the Items  field. Type the number of milliseconds in the Duration  text field to set the duration of the transition. If less than 10, the number is interpreted as a speed (pixels/millisecond). This is probably desirable when scrolling items with variable sizes. Determines whether the timeout between transitions should be paused when mouse pointer is hold over by checking the Pause on hover  checkbox. This option is enabled by default. To avoid any issues with the pictures stretching skewing, it is advised to add pictures of the same dimensions and set the dimensions of the slider to the same values. If you want to create a picture slider with landscape images, please avoid any portrait images to this picture slider, because these vertical images will be stretched and skewed to fit the full slide.